This inviting Craftsman bungalow's exterior is highlighted by cedar shakes and square tapered half-columns on stone piers. With custom-styled elements including a Jack & Jill bath, a mud room, laundry chute and a convenient e-space in the kitchen, this plan was designed with family living in mind. The two story foyer leads past the dining room with a coffered ceiling into the cozy great room with a vaulted ceiling. The breakfast nook is filled with natural light from surrounding windows and the kitchen offers more seating at the curved island. The master suite is conveniently located near the utility room and has access to the large screen porch. The window seat offers rear views and a cozy nook to read a book or relax. The bedroom/study on the main floor creates a flexible space for various uses including a guest suite, home office or den. Built-ins throughout give this home an authentic Craftsman feel and offer additional storage. Two bonus spaces on the second floor provide room for even more storage and expansion. 1st Floor: 1754 Sq. Ft.
2nd Floor: 574 Sq. Ft. Bonus Room: 383 Sq. 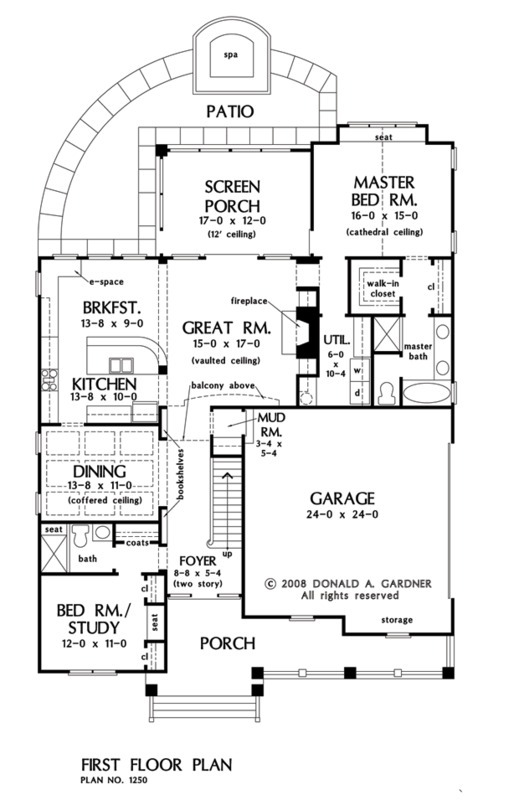 Ft.
House Dimensions: 48' 4" x 66' 4"
Master Bedroom: 16' 0" x 15' 0"
Balcony : 15' 0" x 5' 0" x 8' 0"
Bedroom #2 (Vaulted): 13' 0" x 11' 0" x 8' 0"
Bedroom #3 (Vaulted): 13' 0" x 11' 0" x 8' 0"
Bonus Room : 14' 4" x 18' 8" x 8' 0"
Breakfast Room : 13' 8" x 9' 0" x 9' 0"
Dining Room (Coffered): 13' 8" x 11' 0" x 9' 0"
E-Space : 4' 8" x 9' 0" x 9' 0"
Foyer (2 Story): 8' 8" x 5' 4" x 18' 0"
Garage Storage Bay : 12' 4" x 2' 0" x 0' 0"
Great Room (Vaulted): 15' 0" x 17' 0" x 18' 0"
Kitchen : 13' 8" x 10' 0" x 9' 0"
Master Bedroom (Cathedral): 16' 0" x 15' 0" x 14' 8"
Mud Room : 3' 4" x 5' 4" x 9' 0"
Other : 6' 0" x 12' 8" x 8' 0"
Patio - Rear : 34' 8" x 27' 10" x 0' 0"
Porch - Front : 33' 4" x 5' 0" x 10' 2"
Porch - Screen : 17' 0" x 12' 0" x 12' 0"
Utility Room : 6' 0" x 10' 4" x 9' 0"